WESSELS: Where exactly was that house on Karresteeg? 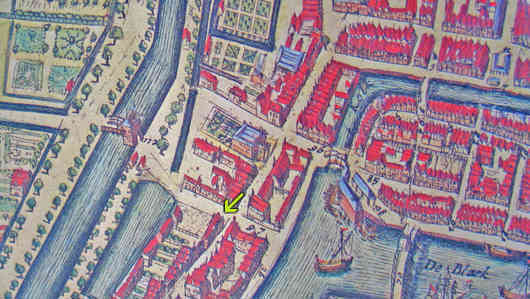 On this 17th century map (by Carolo Allard) the house at Karresteeg, at the corner of Schiedamschendijk, is pointed to by the arrow. Two blocks north is the Schielandhuis (blue roof), at Korte Hoogstraat which is the extention of Schiedamschendijk. Walking through Karresteeg in western direction, along Wessels’s grounds, you walk along de Binnenvest and cross the Stadsvest via de Coolsche Poort and the Binnenwegsche Bridge. Detail of a map made in 1839. The Binnenvest has been filt up and houses have been built on the south side of Karre(n)steeg. 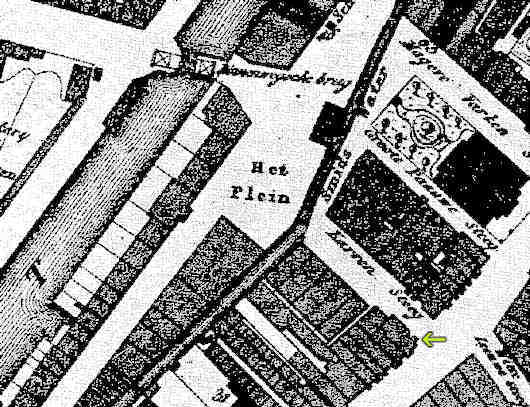 The Schielandhuis is standing between the Groote Paauwesteeg and the Magere Varkensteeg (later Boymansstraat and nowadays Bulgerstein). The Schielandhuis in Korte Hoogstraat. Utter left on above painting of about 1840 you can see just a part the Wessels house, at the corner of Schiedamschendijk and Karresteeg. As appears from above newspaper advertisement (1846), a grandson of Evert was still living in Karresteeg then: Johannes Everardus. The business of his brother Everardus was situated on the Binnenweg. Their parents were Everardus Wessels (died in July 1846) and Johanna Buderman. The spot where Wessels’s house was standing on a picture taken in 1930, from the northeast. It is unknown in which year the house on this picture was built, so I don’t know whether or not it is the original house. The Schielandhuis cannot be seen on this picture. 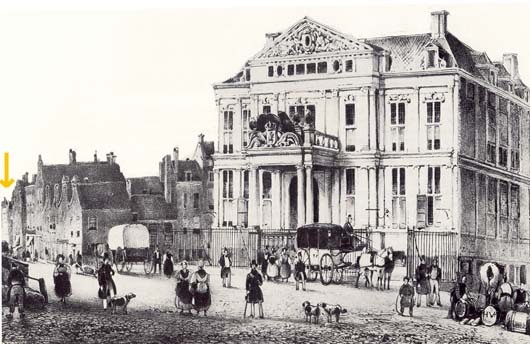 It is on the opposite of the Gerzon-building (nowadays the Fortis Bank building is on this spot), at Korte Hoogstraat, the extention of Schiedamsedijk. And here the spot where the house would have been on a photo taken in 2004 (from the southeast). 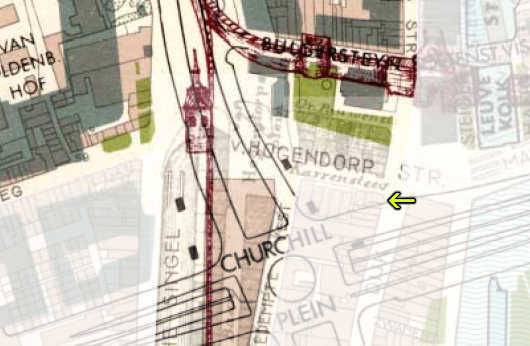 Since the bombardment of 1940 Karrensteeg has completely disappeared from the streetplan of Rotterdam. 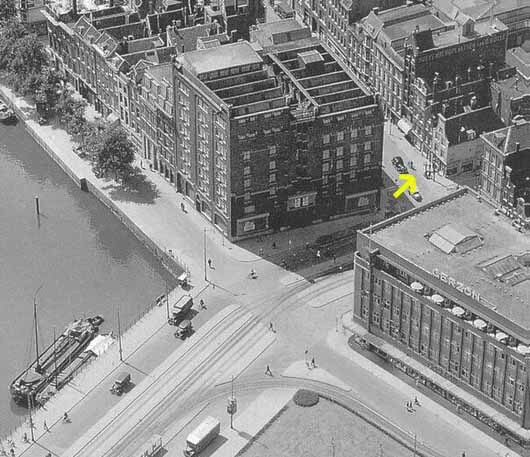 On the spot of Wessels’s old house now the subwaystation Beurs/Churchillplein is situated. At the right on the photo you see the Schielandhuis, and next to it the black marble building of Robeco. In the right-hand topcorner a detail can be seen of Fortis building’s ‘rucksack’.